The measured value of resistance Rm, would be equal to the true value R, if the ammeter resistance is zero and the voltmeter resistance is infinite, so that the conditions in the circuit are not disturbed. But in actual practice this is not possible and hence both methods give inaccurate results. In this method ammeter measures the true value of current flowing through resistance but voltmeter does not measures the true value of the voltage across the resistance. the voltmeter indicates the sum of the voltage across resistance and ammeter. Let Ra be the resistance of the ammeter. It is clear from the above equation that the error will be small if the value of the measuring resistance is large as compare to the internal resistance of the ammeter .therefore circuit should be used when measuring resistances are high. In this circuit the voltmeter measures the true value of the voltage across the measuring resistance but the ammeter does not measures the true value of the current flowing through the resistance .the current through the ammeter is the sum of the current through the voltmeter and resistance. Let Rv be the resistance of the voltmeter. It is clear from the above equation that the relative error will be small if the resistance under measurement is very small as compared to the resistance of the voltmeter .hence the circuit should be used when the measuring values of resistances are low. In our day today life, many times we require to measure different electrical quantities like current, voltage, resistance, etc. While doing experiment, there is necessity of multimeter. As we have already discussed about multimeter, how it measures different electrical quantities like electrical current, voltage, resistance, etc. But the basic instruments for the measurement of electric current and voltage are ammeters and voltmeters respectively. Let us discuss these instruments one by one, operating principle or working principle of ammeters and voltmeters, finally major differences between ammeters and voltmeters. Analog ammeters and voltmeters are classed together as there are no fundamental differences in their operating principles. The action of all ammeters and voltmeters, with the exception of electrostatic type of instruments, depends upon a deflecting torque produced by an electric current. In an ammeter this torque is produced by a current to be measured or by a fraction of it. In a voltmeter this torque is produced by a current which is proportional to the voltage to be measured. Thus all analog voltmeters and ammeters are essentially current measuring devices. The essential requirement of measuring instruments are (i) that its introduction into the circuit, where measurements are to be made, does not alter the circuit conditions ;(ii)the power consumed by them for their operation is small. Ammeters are connected in the series with the circuit whose current is to be measured. The power loss in an ammeter is (I^2.Ra) where I is the current to be measured Ra is the resistance of the ammeter therefore ammeter should have low electrical resistance so that they cause a small voltage drop and consequently absorb small power. Voltmeters are connected in parallel with the circuit whose voltage is to be measured .the power loss in voltmeter is (V^2/Rv), where V is the voltage to be measured and Rv is the resistance of the voltmeter. Therefore voltmeters should have a high electrical resistance, in order that the current drawn by them is small and consequently the power consumed is small. A voltmeter is a voltage measuring instrument. We can measure the potential difference between any two points in an electrical network using a voltmeter. Let us design and make a simple voltmeter using 8051 microcontrollers which you can use as a mini-project in your college. There are two types of voltmeter as analog voltmeter and digital voltmeter. Analog voltmeter moves the pointer on a scale but it has some limitations like the accuracy of few percent of full scale. 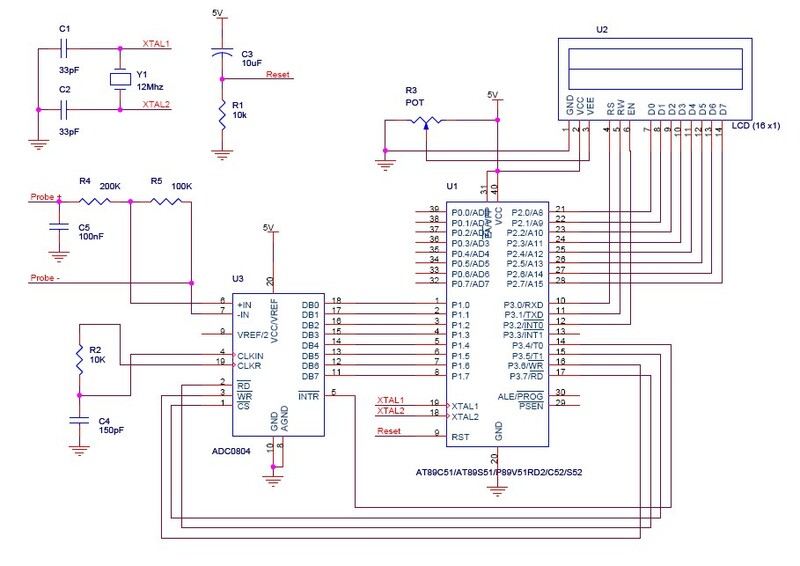 In this section, we are going to make a digital voltmeter using 8051 microcontrollers. A digital voltmeter can display the numerical value of the voltage on a display by use of analog to digital converter (ADC). All the data processing and manipulating are in digital form, so it is essential to use ADC. We have used ADC0804 analog-to-digital converter IC. The range of input voltage is 0-15V. 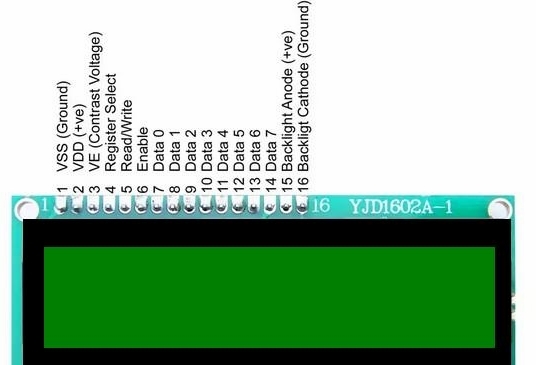 Here the input voltage should be DC voltage so as to get the steady output on the LCD display. If you give the AC voltage as an input, it will display continuously running numbers as the nature of AC voltage. Click here to download the C program, Hex file and project report of digital voltmeter using 8051 microcontrollers.